I'm getting cranky in my old age, but somebody's gonna poke an eye out with all the kids brandishing weapons at the Medieval Fair. First of all, anyone over the age of 12 who attends the Medieval Fair is, by definition, a little bit mentally, you know, not quite right. So the fact that they're all buying 6-foot steel swords is not too comforting. The next time they lose a Dungeons and Dragons game or get dissed by the Goth chick in Geometry class...I don't wanna be around for that. Meanwhile, the little kids, the 5- and 6- and 7-year-olds running around swinging the plastic and wooden swords at each other. Where are their parents? Jennifer and I don't allow that, of course. We limit our kids to small machetes, daggers, and cross-bows. OMG, I'm, like, so old. I walked by a colleague's desk today and there was a picture of a conservative-looking man in his 60s--apparently her father. And, thinking I was being funny, I said, "Why do you have a picture of Lawrence Welk on your desk?" And she said, seriously, "Who's Lawrence Welk?" So I thought, well, okay, so she's a little light on her cultural literacy. So I asked the person at the cubicle next to her, just to reassure myself, "You know who Lawrence Welk is...right?" And that person said no. And so did the guy in reception waiting for the elevator, and Tony the assistant down the hall, and Nora the circulation director ("Wait--is he a producer?"). 0 for 5. 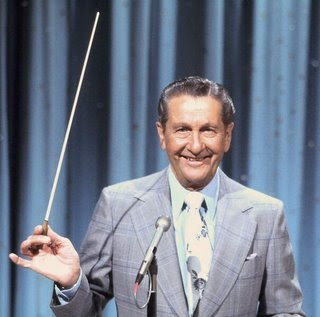 Now, I'm not saying it's really all that important, in the scheme of things, to know who Lawrence Welk is. But...this raises a whole new set of insecurities for me. If I make some sort of off-the-cuff comment about, say Olivia Newton-John, will anyone know what I'm talking about? Can I still make a reference like, "She's a regular Marsha Brady?" without seeming like I'm 80? God forbid I should say, "Hey, look at the guy in the white suit, it's Colonel Sanders." Everyone will be texting to their friends: omg he's clueless. All right, I have to go help Ethan fight some computer battle on Planet Teenager or whatever. Okay, so for the past year Ethan has refused to cut his hair because he claims he's growing it long "for a movie role." After many months of prodding he finally dictated the script to Jennifer, who dutifully transcribed 8 pages, single-spaced. Locations include a school, an underground laboratory, a helicopter, the mountains above Los Angeles, a cave, and a castle. 2) I have another movie I want to shoot with him, for which he needs short hair and for which I've already purchased costumes (i.e. "Officer and a Gentleman" re-make...seriously). Alas, we've managed to shoot about half of his movie so far. Here's a sneak preview. Well, it's been one full week of school for the boys, and I'm unhappy to report that I have absolutely no information whatsoever. Todd: How is school going? Todd: What did you do today? Ethan: Boring stuff. I need to go on DragonFable.com. Todd: Samuel, how is school going? Todd: What kind of stuff? Ethan: Dad, once in "My Gym Partner is a Monkey," Jake was talking to another guy and he said, "What's on Mars?" and the guy said, "Stuff." And Jake said, "What kind of stuff?" And the guy said, "Mars stuff." And Jake said, "Oh, cool, I like Mars stuff." Mom, I made up a pirate karate move. Watch this. He has a gentle soul that absorbs love and offers it back to anyone who needs it. The world is a better place because of him. Let's not get all maudlin about it. Yeah, it was the last weekend before it closes for good, so we went to say goodbye. But the press makes it seem like Astroland was the greatest thing since Coca-Cola Zero. Built in 1927, it's one of the all-time great wooden coasters. From the crest you can see the beach, the parachute jump, the ocean beyond. It still packs a punch, and what makes it extra cool is the fact that it's a legend. Status: Landmarked since 1991, so it ain't going nowhere. 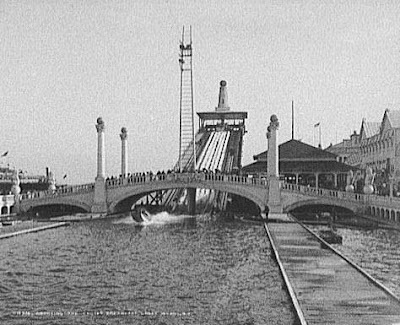 The first of Coney's 3 great parks (opened in 1897), and the longest-lived: it survived until 1964, at which point everyone declared Coney Island officially dead. Status: The land is now the Brooklyn Cyclones' baseball stadium. Coney Island remains in a coma, yes, but still not quite dead. An icon on Coney's skyline since 1920. At 150 feet tall, you can see for miles. Status: Landmarked in 1989, ain't going nowhere. 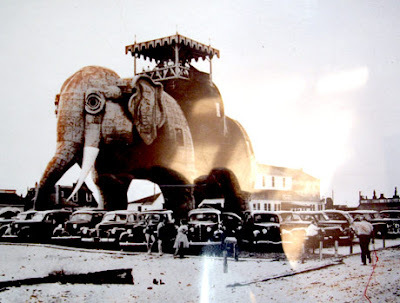 It was originally built for the 1939 World's Fair, then moved in 1941 to Coney Island, where it helped macho men in uniform impress the girls...which in turn led to the Baby Boom. But that's another story. Status: It ceased operations in 1968, but is now landmarked and is on the skyline to stay. For 50 years there were 3 very cool and very large roller coasters operating virtually side by side at Coney: the Cyclone, the Tornado, and the Thunderbolt. 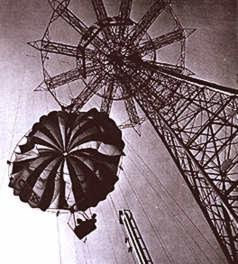 The Thunderbolt was the first of these, pre-dating the Cyclone by 2 years. Its steep first drop inspired the design of the Cyclone and many others that came afterwards. Status: the Thunderbolt fell into disrepair and closed for good in 1983. It remained a hulking ruin until it was torn down in 2000. 8. Nathan's Famous Hot Dogs. They didn't invent the hot dog (more about that below), but they made it famous, and became a Coney Island institution. Status: it's been around since 1908, and still going. There were over thirty coasters built at Coney from 1884 through the 1930s. The Giant Racer, built in 1911, had a beautiful whitewashed structure and was one of the largest coasters ever built at the time. 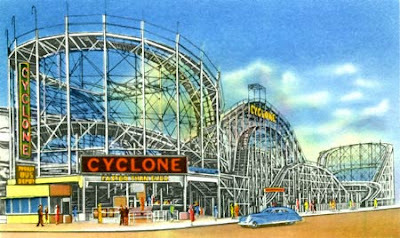 Not only did it precede the Cyclone by 16 years, it was razed to make room for...the Cyclone. Status: Long gone, of course. Fine to mourn Astroland's passing, but at least give Coney Island the dignity of acknowledging its much grander history...and hopefully future. It was hot, but it really didn't take very long, and there were guys selling Gatorade out of coolers along the way. We decided we would not want the job of climbing to the top of the towers every morning to raise the flag. I was expecting a little more on the Brooklyn side, frankly. There was an ice cream shop with a long line out the door, a pizzeria with a long line down the block, and a sushi restaurant with no one else inside. So we had sushi, then wandered down several blocks of unexciting nothingness until we got to the subway back to the more exciting world of Manhattan. I'd file this one in the "Good to do every five years" category. "All right. No more hammering. Someone is going to get hurt. Put the hammer and the screwdrivers away." "Guys? PLEASE keep your pizza plates off the floor and away from Kahlua." "No, Datar, please do NOT tell Ethan how to build a bomb." Ethan (signing on to Neopets): It's called Hot Dog Hero. You have a limited amount of ketchup which you can use as a little bridge. And mustard is super bouncy so you can use it as a super bouncy bridge. You can use it to bounce up on things. And mayonnaise is used to walk up walls. So that's how you play. Samuel: Ethan! Do you remember how to play? 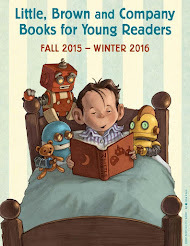 Samuel: Look out! No, no. Ethan (panicked): How do I jump? Samuel: You know when that happens you can draw another line beneath you. 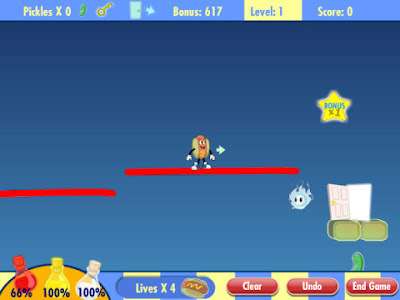 Hot Dog Hero: Way to go! You completed level 1. Ethan: THAT'S how you play! Samuel: Ethan, jump to get the pickle! Ethan: I know how to do it. See? Samuel: There's the key! More mustard! Ethan: Oh! I'm gonna go with ketchup! Samuel: Maybe you should go with mayonnaise. You could use mayonnaise and walk right to the door. Hot Dog Hero: Sorry, but you have run out of hot dogs. Ethan: Oh, no! (Brightens) I'm gonna play again! Yes, we love Rye Playland, but we're not married to it. It has amusement rides, a lake, a beach, even a swimming pool--and, as a bonus, Art Deco architecture. The problem is that it's not quite the best at anything--Lake Compounce has better get-wet attractions, Connecticut and Long Island and Jersey have better beaches, and, you know, Samuel, Ethan, and I--we're adventurers; we can't be tied down. The boys have mysteriously grown since last summer, so we bravely wandered beyond Kiddie Land for the first time and tried a couple of more manly rides like the Family Flyer (a junior roller coaster) and Go-Karts. Highlight #1: Standing just outside the Playland Plunge (we were too scared to actually go on it) and getting drenched by the splash. Highlight #2: Throwing snowballs into Long Island Sound in August, courtesy of a mound of snow recently Zambonied from the indoor ice rink.